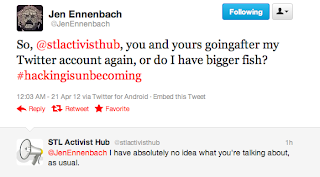 GIGLI Cofounder Ennenbach Bizarrely Accuses Me of "Hacking"
Remember GIGLI, the completely ineffective astroturf group formed after there was a split in the St. Louis Tea Party? 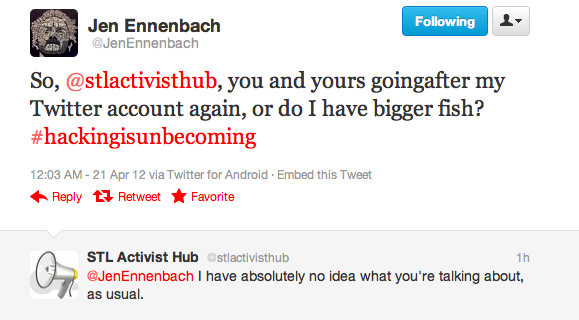 They have now completely given up on pretending to be a real "grassroots" group and haven't posted anything new on Twitter for over a month. And recall that unlike the St. Louis Tea Party which actually did organize rallies with hundreds of people in their prime, GIGLI hasn't done anything to show they could organize themselves out of a paper bag. But they don't need to because the St. Louis media will dutifully pretend they're an actual group without requiring them to establish any credentials.